A little rain, then some sun. Still cold. Suddenly, there is a real show of flowers on the verge. Field Forgetmenot - Myosotis arvensis. The Ox-eye Daisy - Leucanthemum vulgare - has just opened. The right hand image shows a tiny (5mm) micro-moth - Glyphipterix simpliciella - that was obvious on most of the flower heads. The Foxglove is about to burst and I spotted the leaves of the Marsh Cinquefoil - a stunning plant. 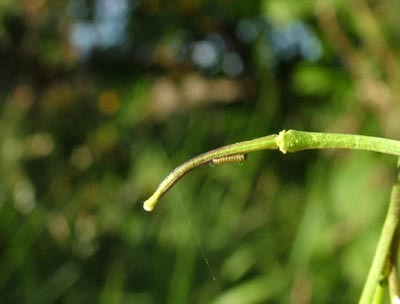 This is the first larva of the Orange Tip butterfly for this year. It's from the same specimen of Cuckoo flower that carried the egg on 9th May, so it's 21 days from egg to exploration. 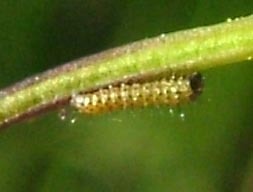 The pictures might not be the best, but they're not bad considering the caterpillar is only 2 mm. long. Same date of emergence as last year, give or take a day. I almost thought of this as a quiz, but it would be too easy. It's the flower head of Ribwort Plantain taken from directly overhead.